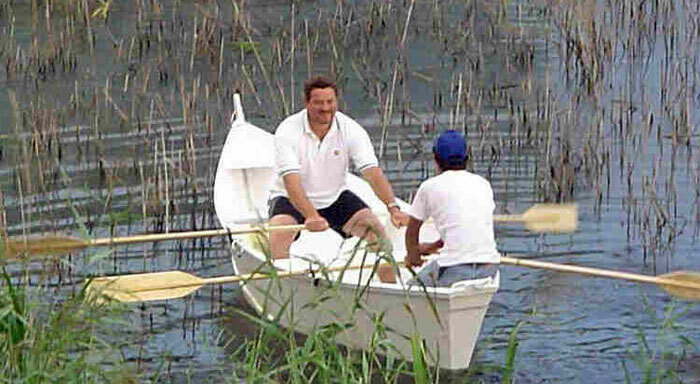 Jeff Spira of Spira International wrote, "Gabriele Di Marzio of Abruzzo, Italy built this 14' dory with his two sons. The modified Spira Juneau Grand Banks dory design was built with hardwood frames and covered with 5 mm beech plywood on the sides and 10 mm on the bottom. Gabriele enlarged the hull a bit from the plans and added more rocker than originally called for. The completed hull is still light enough to cartop yet holds three people with two rowing stations. The design is available from Spira International, Inc., P.O. Box 2155, Huntington Beach, CA 92647, www.spirainternational.com.